Dried beans are much cheaper. Switching from canned to dried beans will reduce your costs by 75% on average. You can buy in bulk and store for years. Dried beans take up less space. Because 1 cup of dried beans turns into 3 cups of cooked beans, those with limited shelf space should stock up on dried beans in those convenient 1 lb bags rather than bulky cans. Dried beans have better texture and flavor. The canning process just destroys beans, making them rather mushy, and they can take on the flavor of the can if you buy discount brand beans. You're also limited to the types of beans you can buy, with the varieties usually chosen for high yield and cost instead of flavor. Dried beans are easily scaled with recipes. When you cook with canned beans, you're usually cook in 14.5 oz intervals. When you use dried beans you can scale up or down. 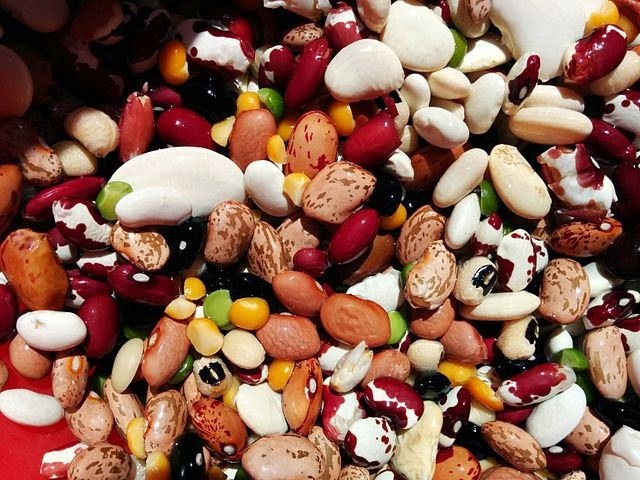 You can also blend types of beans to add better color or complexity to your dishes. Properly cooked dried beans avoid gassy aftermath. Beans have natural toxins to protect themselves from animals and incests. Properly cooking the beans can deactivate and destroy these toxins. The canning process in general leaves from of these toxins in place, which is why people complain about being gassy after eating beans. I've written up how to properly soak beans to avoid this problem below. Bring to a boil, boil for two minutes, remove from heat, cover and let sit for an hour. Drain, rinse, drain, cook. Once beans have been soaked, they can be cooked according to recipe. One note though is that beans should be brought to a boil at some point for at least five minutes. Standard crock pot can do this on the High setting. Once I've done this I can say I've deactivated the toxins, and drained the water to clear them. Always check your dried beans before cooking and serving them. Because of automation, you will still occasionally find "foreign matter" in your bag of beans. What I'm saying here is that rocks tend to show up on occasion because the machines have trouble distinguishing. the minute you take combing through your beans is much better than an emergency trip to the dentist for a cracked tooth.